Breakfast is the most important meal of the day. That's a fact that cereal makers know how to cash in on. The cereal aisle is a veritable smorgasbord of choices — whether you prefer the simplicity of corn flakes or something flashier, you can find something that hits the spot. We've put together 23 statistics about breakfast cereal that might have you taking a closer look the next time you're in the grocery store. Seinfeld fans know that cereal is great in the morning, at noon, or even at night, and it seems that more people are jumping on the bandwagon. Mintel's 2012 report on breakfast cereals in the U.S. found that 46 percent of cereal aficionados surveyed enjoy it as a snack from time to time, while 42 percent give it the thumbs up for lunchtime or dinner. 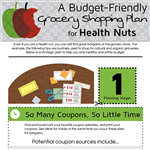 In 2013, the supermarket industry generated approximately $620 billion in revenue. While a lot of food spending goes towards basics like milk, bread, meats, and produce, consumers are shelling out more on cereal than you might think. According to a recent industry analysis from IBISWorld, a consumer marketing research agency, cereal sales account for an $11 billion share of the market. Aside from things like grains, nuts, and dried fruits, breakfast cereals contain their fair share of sugar. All in all, the cereal industry uses approximately 816 million pounds of sugar each year, according to Scott Bruce and Bill Crawford, authors of Cerealizing America: The Unsweetened Story of Breakfast Cereal. That's enough for each person in the U.S. to be coated with three pounds of the sweet stuff. Cereals marketed specifically towards kids have the highest sugar content, leading some industry experts to draw parallels to the tobacco industry. An analysis of 1,556 breakfast cereals published in 2014 found that on average, children's cereals contain 40 percent more sugar than those geared towards adults. For kids who have one serving of cereal a day, that's the equivalent of nearly 1,000 teaspoons of sugar each year. While cereal is a breakfast favorite around the world, folks in the U.S. can't seem to get enough of their favorite brands. Americans buy around 2.7 billion boxes of cereal each year, enough to stretch all the way to the moon and back. That amounts to about 14 pounds of cereal that the average person consumes annually. The next time you come across something in your cereal that looks like a burned or oddly shaped flake, you might want to take a closer look. The Food and Drug Administration acknowledges that a certain amount of animal matter — including rodent hairs and bug fragments — may show up in your cereal. That gives new meaning to the concept of a "surprise inside." Sticking with cereals that are high in protein, low in sodium, and packed with vitamins and minerals is a great way to satisfy your craving without putting your health at risk. In some cases, however, you could be getting too much of a good thing. A report published in 2014 found that 23 brands, including Wheaties and Raisin Bran, contain levels of zinc, niacin and vitamin A that exceed safe levels for children aged 8 or younger. Like most kids' cereals on the market, the top ingredient in Honey Smacks is sugar. So much, in fact, that it takes top honors as the most cavity-inducing cereal around. According to the Environmental Working Group, those seemingly innocent looking wheat puffs are actually more than 50 percent sugar. Breakfast lovers far and wide know that March 7 isn't just another day; it's actually a holiday commemorating the deliciousness that is cold cereal. While no one really knows when or how National Cereal Day began, that doesn't stop people from enjoying the occasion with a bowl of their favorite brand. Even though ready-to-eat cereals continue to dominate their share of the market, hot breakfast goodies are steadily gaining ground. According to Information Resources Inc., a marketing research company, oatmeal and other instant cereal products accounted for a $1.2 billion share of sales in 2013, up 4 percent from the year before. In 1898, W.K. Kellogg and his brother John Harvey Kellogg were trying their hand at making granola when a lucky accident led to them producing flaked wheat berry. One thing lead to another, and in 1906, Kellogg's Corn Flakes began hitting the shelves of local supermarket. If you've ever turned on the TV on a Saturday morning, you've probably had to sit through your fair share of commercials for Trix or Lucky Charms. Even though it seems like all you ever see are flashy ads for the kiddie crowds, the majority of cereal brands are designed just for adults. A 2012 report from the Yale Rudd Center for Food Policy and Obesity found that of 124 brands surveyed, 59 percent are designed just for grown-ups. When you're cruising down the supermarket aisle, pay attention to the packaging and you'll feel overwhelmed by the number of brands designed for kids. They tend to have the brightest colors and a cartoon mascot smiling on the box. That's no accident. In 2011, cereal companies shelled out $264 million on marketing campaigns geared at kids, with Kellogg's, General Mills and Post spending the most on media advertising. What's on the box is almost as important as what's in it when it comes to getting shoppers to buy a particular brand. A recent study from Cornell University shed some light on how a cereal's appearance determines sales. Researchers found that when the box featured a specific character, brand trust increased by 16 percent when the character appeared to be making direct eye contact, versus looking down. Rice, corn, and wheat factor heavily into U.S. cereal production, and you might be astounded to learn how much goes into making all your favorite brands. According to the National Association of Wheat Growers, approximately three-quarters of all U.S. grain products, including cereal, are made from wheat. Just one bushel is enough to make 45 24-ounce boxes of cereal. If you're a fan of Cap'n Crunch and his tasty Crunch Berries, what we're about to tell you might be a little shocking. Despite their name, real fruit doesn't factor into their makeup, aside from a small amount of strawberry juice concentrate. Instead, they're made mostly of sugar, corn, and artificial coloring. Perhaps we should have spilled the beans to this woman a little earlier. 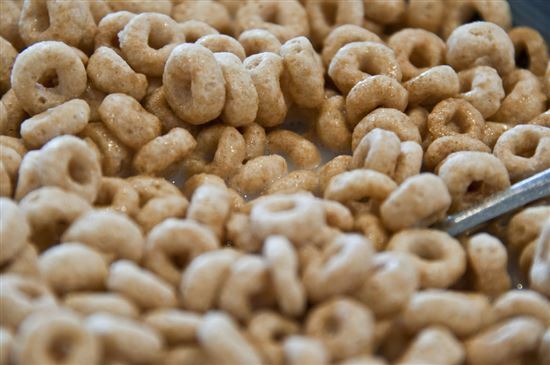 Cheerios aren't chock full of colored marshmallows and they don't have a cartoon tiger on the front of the box, but it's that scaled-down approach that keeps consumers coming back for more. Marketing research data from IRI shows that Honey Nut Cheerios continue to be the top-selling brand, with classic Cheerios landing in fourth place after Frosted Flakes and Honey Bunches of Oats. The next time you sit down to a bowl of Cheerios, pay attention to what happens when you pour the milk. You may notice that those little oat rings begin floating towards one another, a phenomenon dubbed the "Cheerio Effect" by scientists. The term is used to describe what happens when floating objects are naturally drawn to one another thanks to buoyancy and surface tension. While there are more than a thousand cereal brands currently on the market, there are scores more that didn't translate to big business for their manufacturers. The '80s and '90s in particular saw a huge influx of cereals that featured cartoon characters, celebrities, and athletes. Among those that will be most missed are Bill & Ted's Excellent Cereal, Urkel-Os and Mr. T Cereal. We pity those of you who didn't get a chance to try any of them in their heyday. In 2012, a research study on the chemical content of baby foods caused a major uproar after its publishers determined that certain items, including rice cereal, contained significant levels of arsenic. A 2013 study by the Food and Drug Administration involving 1,300 samples of rice products found that they contained between 0.1 and 7.2 micrograms of inorganic arsenic per serving. At this point, there's no solid link between the arsenic levels and long-term health problems, but it's something to think about the next time you dig in to a bowl of Rice Krispies. In an effort to make cereal more accessible to a wider base of consumers, an increasing number of companies are converting their products into bars that can be eaten without milk, anytime and anywhere. According to CSP magazine, a trade publication covering the convenience store and fuel industries, cereal bar sales jumped by 2.1 percent in 2013. Rice Krispie treats lead the way, bringing in more than $58 million in revenue. Eating Froot Loops is a little like taking a bite out of a rainbow, but in some countries, there's no pot of gold waiting at the end. In their book, Rich Food, Poor Food, authors Jayson and Mira Carlton detail which foods are available in the U.S. but not in other countries. Thanks to the presence of Yellow #5, Red #40 and other dyes, you won't see Froot Loops on the shelves in the U.K., Norway, Finland, France, or Austria. A diet high in soluble fiber has long been linked to lower cholesterol, and researchers from the Harvard School of Public Health now believe that the kind of cereal you eat can help you live longer after a heart attack. The findings, published in The British Medical Journal, suggest that eating cereal regularly after a serious heart event significantly improves mortality rates. That's a great reason to make those bran flakes a regular part of your morning routine. Share on Facebook "23 Breakfast Cereal Statistics That Will Surprise You"